I mentioned in a previous post that I am attracted to small towns, most likely because I was raised in Mission, Texas — a small South Texas town just north of the Rio Grande River. Mission was my Mayberry, a great place for a kid like me to have all kinds of adventures. Although I don’t think that I could actually live in a small town at this stage of my life, there is something enviable about the relatively slower pace of life in small towns, where the folks in a hurry are the ones who are out-of-place. I am in South Texas today to visit with my Dad. This morning we drove to the cemetery to place fresh flowers on my beautiful Mom’s grave. Afterward we stopped by Whataburger to have breakfast with my Dad’s retired friends. And then we stopped by the HEB grocery store on the way back to the house to pick up a quick item. Dad and I stood in the Express Lane for what I thought would be a quick transaction. But I was wrong in assuming that the word Express actually means express in a small town. Here is the short version of what happened this morning. The lady in front of us had two items in her basket — two large bags of cat food. Without warning and as if she had known us her entire life, she turned and smiled and then asked for advice. Cat Lady: Which of these bags of cat food do you think is better? Me: Hmmm. I don’t really know. I don’t have a cat but I do have a nice little dog. Cat Lady: Which of these do you think my cat will like more? Me: I don’t really know Ma’am. It’s my understanding that cats are more selective than dogs about what they eat. But because I do not have a cat I don’t think I’m qualified to tell you which brand of cat food is better. Note: By this time the other folks in line leaned in to listen to our conversation. No one seemed to notice or mind that the guy in front of the Cat Lady had already checked out and was probably halfway home. I politely motioned that she was next in line to pay. So, the Cat Lady turned her attention to the Cashier. Cat Lady: How much do these bags weigh? The cashier slowly ambled around from his cash register and picked up each bag to look for the weight. Cashier: This one here weighs 16 pounds and that one there weighs 15 pounds. Cat Lady: What’s the difference? Cat Lady: No, I mean what’s the difference between them? Which one do you think is better? Cashier: They each seem to have their good qualities, but you will have to ask your cat. Cat Lady: Well then, can you tell me the cost of each bag? Cashier: Let me do a price check for you. Note: By this time I am ready to go and get a shave. Of course, I did not need a shave when we arrived but I have now been in the Express Lane so long that the only thing happening quickly is the growth of my facial hair. Cat Lady: Ok. I will take that bag there. Cashier: I’ll ring it up. Cat Lady: No, I changed my mind. I think that my cat may actually like the other food better so that’s the bag I want. Cat Lady (turning and speaking to me): I think I have made the right choice, but I am not sure. Cashier: Would you like me to page somebody to help you load this 16 pound bag in your car? Cat Lady: No, thanks. I think I can manage it on my own. Me: Good-bye, Ma’am. I think you made a good choice. Have a nice day. Honestly, it was refreshing to meet the Cat Lady and to be reminded that the world seems to rotate a bit slower when you live in a small town. And, that’s not a bad thing. 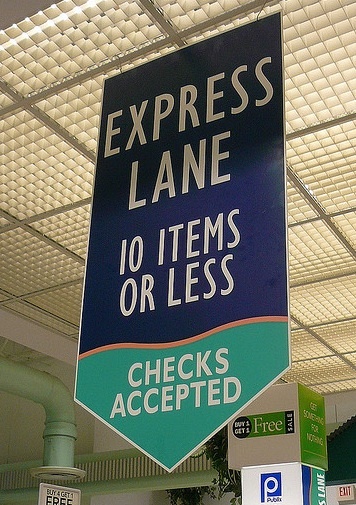 It’s good to slow down and to listen to the concerns of the people around you, even in the Express Lane. I started reading this and I had to stop because I couldn’t stop laughing. I waited til I got home and read it with Christine and Danielle. Christine and I could not stop laughing and it brought tears to my eyes. Omar thanks for sharing your life and thanks for the laughs! Thanks, H. It was really quite amusing. This sweet lady was totally oblivious to the long line of folks behind her. But, no one seemed to mind the wait at all. I think they were all amused by her concern over which bag of cat food to buy. Loved the experience. A friend and I went to Gainesville this week to eat at a local restaurant famous for their fried pies. It was nice to get away from the big city. And the restaurant had “the locals” who looked at “the foreigners” with interest. smile But it was nice to walk down the sidewalk of the city square. It was just a nice slice of Americana on a cool October day! Glad you were able to catch up with your father! It is refreshing to get away from the hustle and bustle of the big city. Small town America can be good medicine.